Mary-Ann here, I don't know where December went or the first part of January!!! We did have two snow days that postponed back to school, so maybe that is where the time has gone? Snow days = NO time for mom!! When I was planning my layout to share with you today, I decided I would choose my all time FAVORITE photo from Christmas and use up some of my leftover stash from Fancy Pants, Merry Little Christmas. I have also been watching a ton of tutorials from other design team members and think I did a pretty good job of incorporating mixed media with my traditional style of scrapbooking. I started with a clean white cardstock base. Added Gesso, rubbed distress inks into my stencils, dropped some splashes of inks and Distress Paints. I still needed something more. I used the same technique I used on my Fall Swim layout (click here to see). I sprayed colors onto my mat, added a little water, turned my cardstock face down on this pretty mess of colors, rubbed it a lightly and voila, smudgy drippy awesomeness. Then I began layering. I cut my title and deer embellishment with my Silhouette. Notice the Fancy Pants Glassine Bag? I tucked my journaling in here on a really large tag I had on hand. To create these droplets of silver, I used a dry paintbrush, dipped it into my Brushed Pewter Distress Paint and let gravity drop the liquid. If you let them air dry, they will be slightly raised to the touch. Hope you have enjoyed my creation. I look forward to seeing you again real soon. Mary Ann, your page is so FABULOUS! 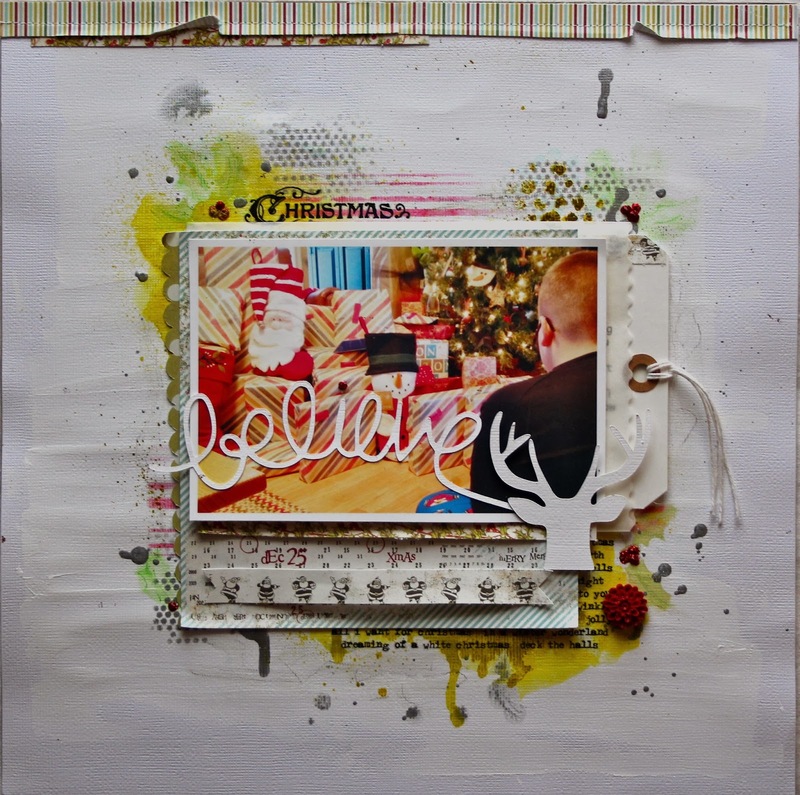 LOVE your photo and the mixed media/colors in your BG! The spashes of silver are way COOL! Looks amazing Mary Ann! I love the whole page, but I LOVE, love, love the silver drops - off to my desk to try that!! This is a beautiful layout, Mary Ann!! Mary Ann this is a wonderful LO!! There is so much going on...so many layers and splatters and yumminess!!! Love it gal! !